Home / Shop / Books / Social Sciences / Social and Behavioral Sciences / Sociology / Five Scarves: Doing the Impossible – If We Can Reverse Cell Fate, Why Can’t We Redefine Success? 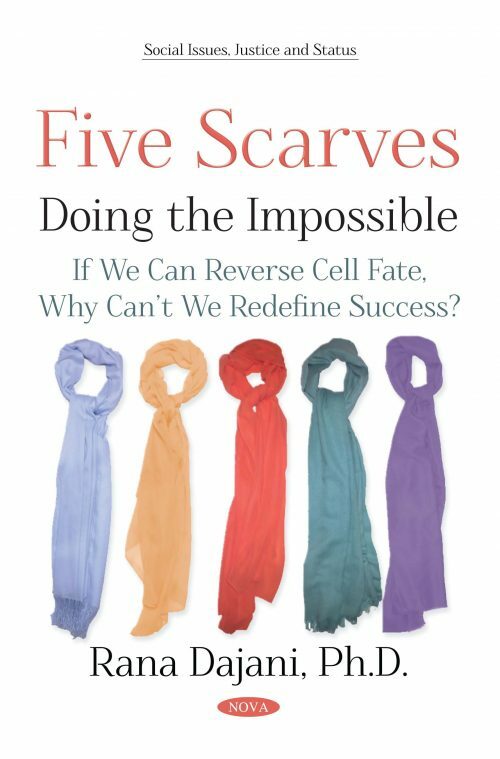 Rana Dajani’s Five Scarves: Doing the Impossible—If We Can Reverse Cell Fate, Why Can’t We Redefine Success? is an exploration of the intersections between gender, race, religion, and science told through the eyes of one of the world’s leading Muslim women scientists. Dajani, a Professor of Molecular Biology at the Hashemite University of Jordan, points to the 2006 discovery of induced pluripotent stem cells which allowed researchers to reverse engineer embryonic life forms, and asks us why a similar breakthrough might not be possible in the pursuit of gender equality. Seeking a paradigm shift in the fight against women’s oppression, Dajani makes the case for radically transforming the social institutions, cultures, and customs of our world to fully validate and support all women. The reader is led through the many phases of Dajani’s dizzying life journey, from the bustling world of Amman, to the quiet neighborhoods of Iowa City, back through Jordan’s universities, schools, and refugee camps, and into the halls of Harvard, Cambridge, Grenoble, and the United Nations. The author wears five scarves, those of a mother, teacher, scientist, social entrepreneur, and feminist. Her story tells of all the challenges she’s faced and the innovations she’s made in everything from genetic analysis and science pedagogy, to grassroots social change and Islamic perspectives on evolution. Finally, Dajani offers a provocative and far-reaching meditation on the fight for women’s liberation today and what it would take to build a truly equal and humane society.